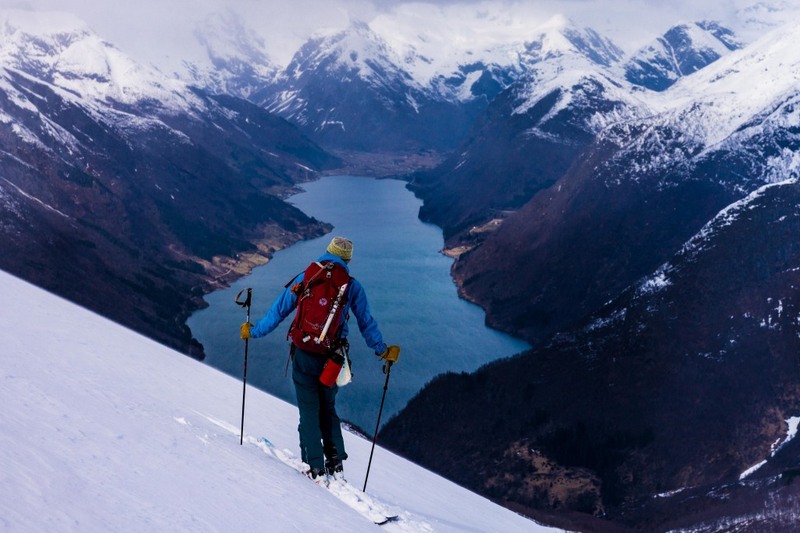 The Sognefjord region has finally gotten its own three day alpine ski tour – The Sognefjord Alpine Traverse. 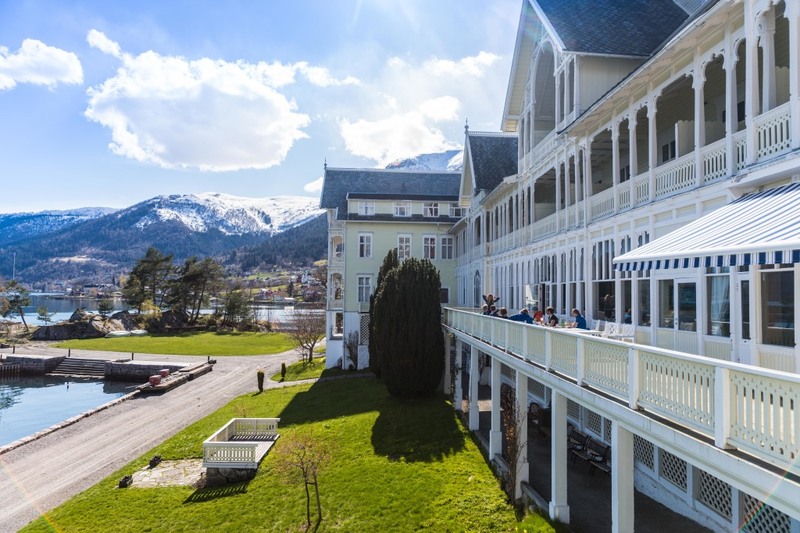 The tour traverses the alpine peaks between the small towns of Sogndal and Balestrand. 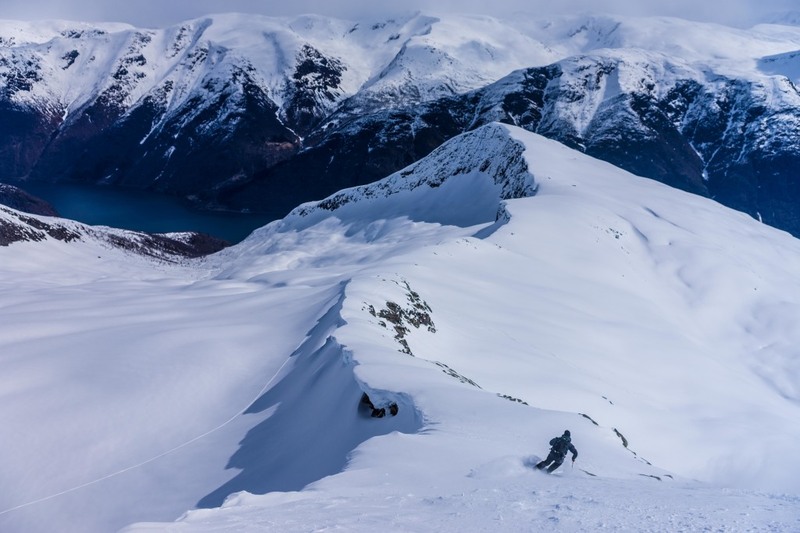 The features that distinguish the tour is the combination of spectacular fjord landscapes, stable snow conditions and lodging at historic fjord hotels. The inner part of the Sognefjord region is famous for its powder snow, which is caused by the sheltered situation far away from the coast, and the closeness to the biggest glacier in the European mainland Jostedalsbreen, which provides a more stable climate than for instance Lyngen or Sunnmøre, while it still enjoys frequent snowfalls. 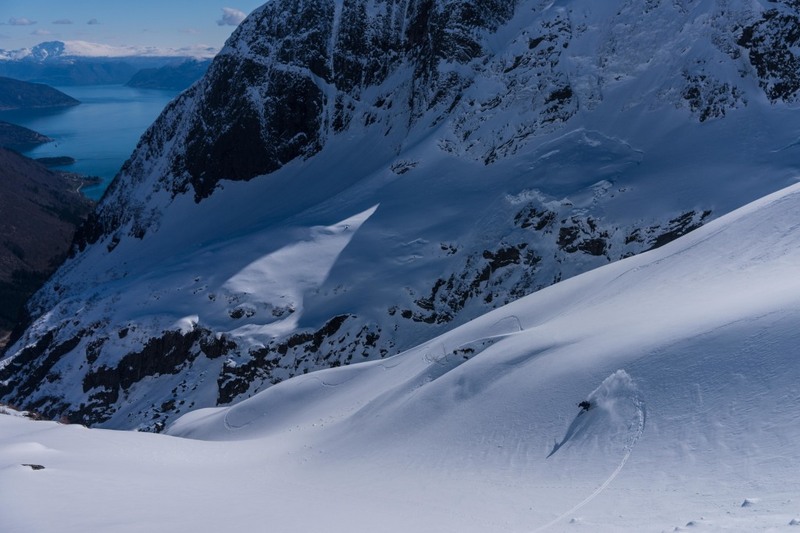 The trip starts in Sogndalsdalen, which is highly popular for ski-touring, crosses the Fjaerlandsfjord and then continues on the narrow and alpine Menes ridge, which is rarely frequented by alpine skitourers. The final day includes the spectacular Keipen peak, which summit is a overhanging cliff overlooking the fjord, quite similar to the Prekestolen in South West Norway. And what could feel better after a long day of skiing than a three course meal with local food and soft beds at unique and historic hotels situated by the fjords? It surely is something different from the overcrowded and spartan mountain cabins of the Alps. The tour departs from the outside of the Frudal-tunnel on highway 5 in Sogndalsdalen at 500 meter above sea level, a 20 minutes bus- or taxiride from the city centre of Sogndal. From here it is a 1100 meter climb to the summit of Bråstadbreen glacier, were you get a view of the Fjaerlandsfjord. From Bjåstadbreen the tour traverses a mountain ridge for three kilometres, to the Ryssebottennipa peak, where the skins is taken off and we can enjoy a 900 meter descent down in a sheltered bowl. Those feeling fit can ascend the peak of Romshestem, which offer stunning views of the Fjærlandfjord. Then the route continues down to the fjord where a boat takes us over the Fjærlandsfjord to the hamlet of Jordalen. The staff at Fjærland Fjordstue hotel provides transport from here to the hotel, which is located a bit further in along the fjord. The second day starts in Jordalen, with a 1500 meters climb to the Saueggi peak on the Menes ridge, which separates the Fjaerlandsfjord from the Vetlefjord. From here we can traverse a bit on the narrow ridge, before avoiding techical sections on the ridge by skiing down 500 meters on super-inviting slopes that tends to offer dry powder snow far into the spring season, due to its eastern aspect. Then there is a 300 meter long climb back up to the southermost part of the ridge, where we ski southwards facing the main Sognefjord basin. The last part involves hiking through the forest down to the hamlet of Menes, where we will be picked up and taken to the Grønlund cabins, situated on the pittoresque hamlet of Torsnes by the waterfront. Day three also starts with a few kilometers with transport on road, to Dalsdalen at 300 meters above sea level. From here we ascend 1100 meters to the Bjørnabreen glacier and then traverses to the stunning Keipen peak. 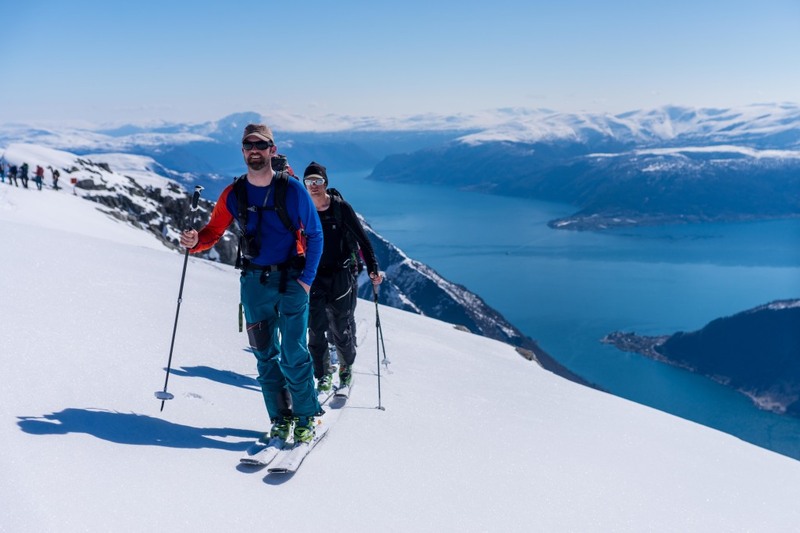 After taking in the view from Keipen of the Esefjord and Balestrand, the route traverses westwards before heading down in the big bowl between the small peak Gulleple and the impressive East face of the peak Vindreken. This is one of the most spectacular ski runs in the region, but still rarely skied. The routefinding from the treeline is critical, as there is only one option that avoid cliff sections and dense forest. In Esebotten we can get a pickup for the last five kilometres to Balestrand centre, were we will celebrate the completion of the trip at the terrace of the famous Kviknes hotel which among others, was a very popular holiday destination for the late emperor Wilhelm of Germany in the early 20th century.  All Breogfjell Mountain Guides working on this tour will be qualified IFMGA Mountain Guides (called “Tindevegledere” in Norwegian) or aspirant guides. You must have good skiing skills (able to ski controlled downward) and good physical condition. The ski tour can be organized with varying difficulty, but some steep slopes is unavoidable. The snow conditions can be variable. We will ski on glaciers and in potentially dangerous avalanche terrain. This ski tour require up to 1800 meters ascent and up to nine hour long days. Several daily stages requires good visibility and stable snow conditions to be implemented. We strongly recommend lightweight alpine ski touring equipment. This trip requires lightweight pack strategy! Do not bring more than what is on the list. 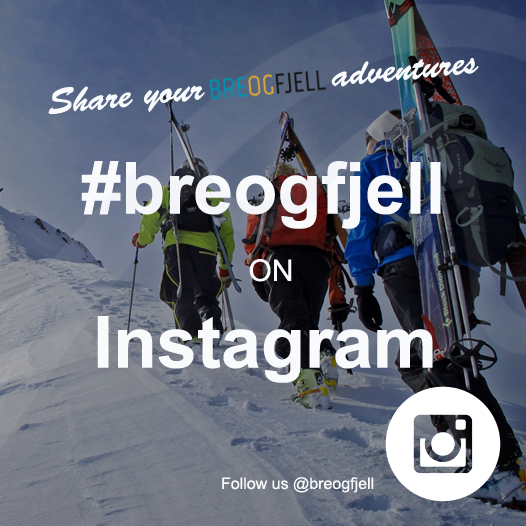 Glacier and avalanche equipment can be borrowed by Breogfjell if noticed in advance. Along the tour we stay in hotels and one cabin. All meals are included. In Sogndal (pre tour): Hotel: Quality Sogndal Hotell, Rooms: Sogndal Lodge. Cabins in Sogndalsdalen (allows direct start from cabin): Uteplassen. This is not included in the package. The first night on the trip we stay in Fjaerland at the unique Fjærland Fjordstue Hotel, that offers gourmet local food. The second day we stay in Vetlefjorden at Grønlund cabins (no hotels in this place, but food can be ordered) In Balestrand we celebrate the completion of the trip with dinner at the legendary Kviknes hotell. We also recommend to spend the night here (optional). The starting point of the Sognefjord Alpine Traverse is in Sogndal. There are several ways to get here! By plane: Sogndal has it´s own airport. Find your tickets at Wideroe.com. 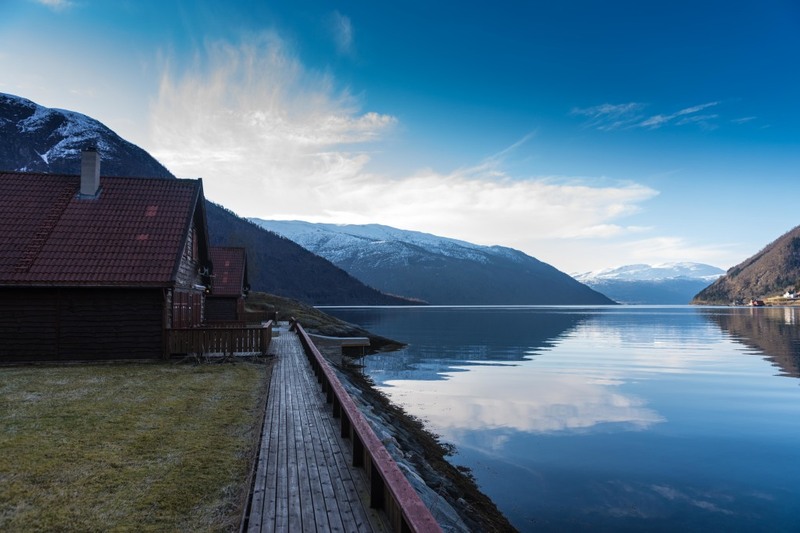 Are you flying in from international airports, Bergen (BGO) is the closest international airport and connects to Sogndal. Oslo (OSL) is also a possibility. By car: Sogndal is a 3 hour drive from Bergen and a 5 hour drive from Oslo. By bus: There is an express bus operating Sogndal-Bergen. There is also an expressbus from Oslo to Sogndal See: www.kringom.no for schedules. By express boat: The Norled express boat has daily departures from Bergen. The boat is an amazing journey through the Sognefjord. NOK 800 pr person in double room. 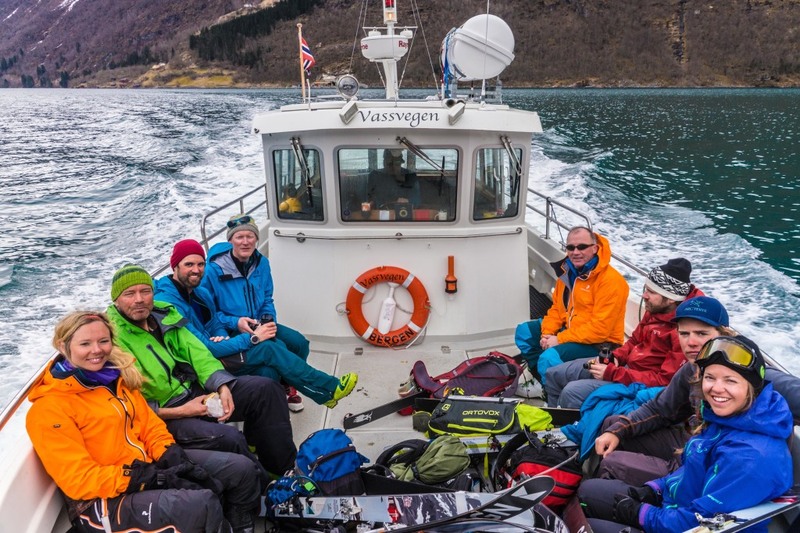 Three full days with ski touring, plus optional night in Balestrand. You must be experienced with steep skiing on varied snow conditions, and handle use of ice axe and crampons. You must be in a good physical shape.